I get asked this question a lot: Is there Tokyo Chicken Stew in Tokyo? Well, not really! 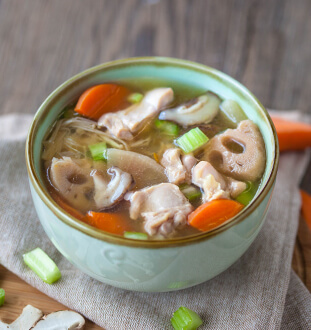 This clear chicken broth was inspired by my love for Japanese teriyaki sauce. The succulent marinated chicken is slowly simmered in a broth made of sweet vinegars and soy sauce. The stew also contains an assortment of oriental vegetables like lotus roots, shiitake and enoki mushrooms, white radish and bamboo shoots, making this a hearty and well-balanced meal. Chicken thigh, corn starch, salt, ginger, light soya sauce (water, soya beans, wheat, salt), teriyaki sauce, vegetable oil, garlic, onion, carrot, white radish, lotus roots, bamboo shoots, shiitake mushroom, enoki mushroom, celery, leek, sugar, water.